These were requested by a friend of mine after she was helping out here at a party and used my warshrags (voluntarily of course!). Done in Sugar and Cream during the baseball playoffs. Blogged here. Hi all: way back when (last year sometime!) 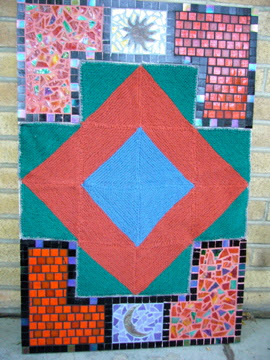 I had posted here about starting a project - the Tilting at Windmills afghan by Pat Ashforth at Woolly Thoughts. Some at the time had been interested in seeing the end result. More info and specs on my blog. The TTC log cabin (commuter log cabin made using swatches) is still in progress as well. Sorry, everyone. I've been having huge issues with blogger and a post for my personal blog ended up here. I have no clue why. Anyway, it was a post about booties - completely unrelated to MDK. But I'll go ahead and edit this post to talk about the yarn I used b/c I think it would be great for MDK projects. 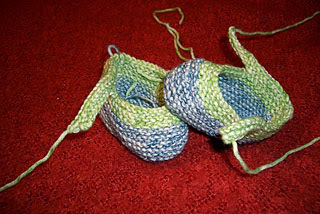 The yarn I'm using for these booties (obviously unfinished) is Classic Elite Yarns, Four Seasons, in Dark Blue Print and Green. Composed of 70% cotton and 30% wool. It's very soft! It would make a gorgeous baby kimono or log cabin blanket, for sure. The yarn comes in lots of great colors - pink, orange, purple, a lighter blue, khaki and more. At long last it's done! 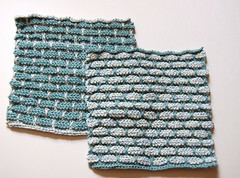 I chose to do the knitted i cord edging and it took FOR EVER! You forget just how long it takes to put together a blanket of this size (Single bed size!) AND do the edging. Top tips : block as you go along. 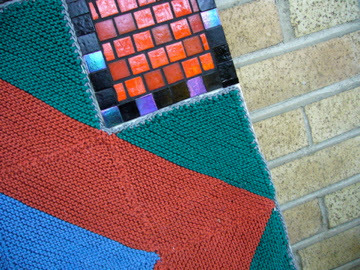 I knitted 8 squares (2 large ones when put together) then blocked them as I knit the next 8. Saves on all all that pinning out at one time. Easier on the back and old knees!